Peel the yam, cucumber, pumpkin, ash gourd. Wash all the vegetables. Cut beans and drumsticks into 3 inches long pieces and all the other vegetables into pieces, about 3 inches long with a thickness like french fries. Cook them covered in just 1 cup of water with turmeric powder and salt, until the vegetables are soft yet firm, for about 15 minutes. If the yam and drumsticks are cooked, all the other vegetables would have been done too. If there is any water remaining, uncover and continue to cook until most of the water has evaporated. While the vegetables are getting cooked, grate the coconut. Grind it with cumin seeds, tamarind and green chilies to a coarse paste, without adding any water. Once the vegetables are done and the amount of water feels right, spread the coconut paste all over the vegetables and gently mix them together preferably with a wooden spatula. 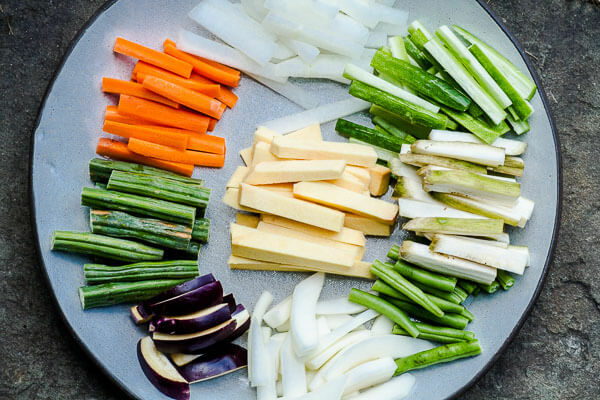 Stir to a minimum and gently to keep the shape of the cut vegetables intact and to avoid a mushy dish. Cook in medium heat for about 5 minutes. Add fresh curry leaves and coconut oil and mix gently. Turn off the heat. Serve hot.